A Dictionary of Mutual Understanding was my book group’s choice for March. When we discussed it last week, it was one of those rare books which everyone had enjoyed. It wasn’t a book I’d heard of before but it sounded like an interesting story so I was looking forward to reading it – and I thought it was superb. It is hard to imagine the horrors witnessed by the survivors of the atomic bombs dropped on Hiroshima and Nagasaki in 1945. I was quite surprised to know there were many survivors to be honest. This book is about Amaterasu who lost her daughter Yuko and grandson Hideo at Nagasaki. She moved to America with her husband and many years later is widowed when a young man appears at her door one day, claiming to be her grandson. She cannot believe this badly disfigured man can be Hideo but he leaves her a package and letter which he claims will prove he is who he says he is. Through Amaterasu’s memories, Yuko’s diaries and letters from a doctor who had been a family friend, the story moves from present to past as we discover what happened in the lead up to that day, and why Amaterasu feels she is in some way responsible for her daughter’s death. I found this a very moving book as I read about how Amaterasu, her husband Kenzo and all the survivors of the Nagasaki bombing coped in the aftermath and in all the following years. As well as no doubt having survivor’s guilt, Amaterasu felt so much guilt about her relationship with her daughter and felt it was her fault that she was where she was when the bomb was dropped. I felt the author captured her changing emotions so well as she began to read her daughter’s diary and the doctor’s letters. I was touched too on reading about Amaterasu’s early life and the love she had for her husband. It was clear that grief and guilt played a huge part in her life following her daughter’s death. Through the voices of those who were absent from the story, I came to a different understanding of some of the characters and why people had acted as they did. The opening paragraphs of each section are like dictionary entries with Japanese words or concepts defined. The significance of each word became clear throughout the chapters and explained a little about Japanese culture and history. These small additions to the story were quite intriguing and I began to look forward to these parts as essential to the story, not just interesting asides. 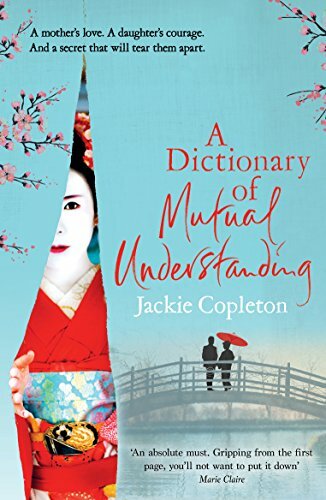 A beautifully told, very moving book, A Dictionary of Mutual Understanding is a story of love, grief, forgiveness and acceptance. The author has worked as a teacher in Japan and her knowledge of Japanese society and culture comes through so well throughout the book. With many unexpected twists and turns, this is a powerful book, compelling and well crafted. My copy of this book was borrowed from my wonderful local library in Portobello. #librariesmatter It was published in paperback by Windmill Books on 5th May 2016 and you can order copy online by clicking here. Amaterasu Takahashi has spent her life grieving for her daughter Yuko and grandson Hideo, who were victims of the atomic bomb dropped on Nagasaki in 1945. Now a widow living in America, she believes that one man was responsible for her loss; a local doctor who caused an irreparable rift between mother and daughter. When a man claiming to be Hideo arrives on her doorstep, she is forced to revisit the past; the hurt and humiliation of her early life, the intoxication of a first romance and the realisation that if she had loved her daughter in a different way, she might still be alive today. This is STILL on my TBR – maybe I need a holiday to have time to read it! Thank you, I really did enjoy it.